A new multi-camera comedy is making its way to Netflix. The Alexa & Katie TV show will premiere on Friday, March 23, 2018 on Netflix. The series comes from creator Heather Wordham, and Malcolm in the Middle vet Matthew Carlson is taking the reins as showrunner. Check out first-look photos, above and below. 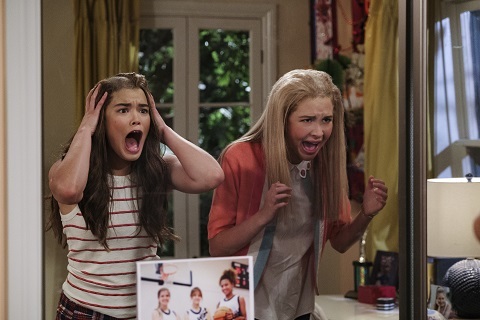 A sitcom, Alexa & Katie centers on Alexa Mendoza (Paris Berelc), who is undergoing cancer treatment, and her best friend, Katie Cooper (Isabel May). The Netflix cast also includes Tiffani Thiessen, Emery Kelly, Eddie Shin, Jolie Jenkins, and Finn Carr. Learn more about the upcoming Alexa & Katie TV series from this Netflix press release. Alexa & Katie is a funny and heartwarming show about two best friends eagerly anticipating the start of their freshman year of high school. Despite the fact that Alexa (Paris Berelc – Mighty Med, Lab Rats: Elite Force) is undergoing cancer treatment, her outgoing personality and enthusiasm for life never falter, especially with her loyal, quirky, and awkwardly adorable best friend Katie (newcomer Isabel May) by her side. At times they’re left feeling like outsiders, during a period when what seems to matter most is fitting in. Tiffani Thiessen (White Collar, Saved By The Bell) also stars as Lori, Alexa’s determined and protective mother. Created by Heather Wordham (Hannah Montana, Reba) with comedy veteran Matthew Carlson (Malcolm In The Middle, Samantha Who?) serving as showrunner, the show’s star is Alexa and Katie’s friendship; whether it be at school, at home, or in the hospital, they are by each other’s side through thick and thin, serving as role models for modern-day female friendships. What do you think? How do you like the sound of the Alexa & Katie TV show? Do you plan to check it out, when it makes its TV series premiere on Netflix? More about: Alexa & Katie, Alexa & Katie: canceled or renewed?, Netflix TV shows: canceled or renewed? Alexa & Katie on Netflix: Cancelled or Renewed for Season Three? Alexa & Katie: Is the Netflix TV Show Cancelled or Renewed for Season Two?